The author is an extension forage agronomist with the University of Wisconsin-Madison. We’re so accustomed to driving over alfalfa when harvesting that we sometimes forget about the potential damage being done to the stand by wheel traffic. This damage can be visible even when a pickup truck is driven over the field a few days after harvest is completed. The tire tracks can be seen as shorter alfalfa until the next cutting is taken. When multistate research trials were done several years ago in the eastern U.S., we found that alfalfa yield of the next cutting declined by 6 percent per day for each day the field was driven over after mowing. For example, a 12 percent yield loss occurred for driving over alfalfa two days after mowing and 30 percent for driving over five days after mowing. These studies were done in small plots where the area was entirely covered by wheel traffic. You may counter by saying that you drive over less than 100 percent of the field when harvesting; though that is true, the percentage of field covered by wheel traffic is probably greater than you think. For example, I am told by the machinery industry that 10-foot cutter bars on mowers are the most common in the Midwest and Northeast. This means that, if the tractor has 20-inch tires and the mower-conditioner has 12-inch tires, and since the mower wheels do not follow in tractor tracks, 76 inches or 63 percent of the field gets covered with tires when mowing. It’s likely that an equal amount gets covered again when raking and at least half as much when chopping or baling. While doing the research, we found some losses from soil compaction due to traffic, but most of the yield loss in the subsequent cutting was due to breaking off regrowth stems. This is why the longer after mowing that traffic occurred, the greater the yield loss in the next cutting. The importance of reducing wheel traffic was more recently shown on a field basis with three years of studies comparing 10-foot mowers to 13-foot mowers. After cutting, two swaths were merged into a windrow and the field was driven over for harvesting five days after mowing on either a 20-foot or 26-foot spacing. On average, we got one-half ton more alfalfa yield per acre for the year (about a 10 percent advantage) where we used the 13-foot mower rather than the 10-foot mower. I don’t believe that the mower width itself had any effect on yield, but wider swaths meant a lower percentage of the field covered with wheel tracks five days after mowing. When in the market for new machinery, you might consider that a wider cutting unit and the resulting swaths will result in higher yields. Another option when considering rakes or mergers is to merge more swaths into a windrow, which will also reduce traffic at harvest. So what can be done to minimize yield loss of the next cutting? The first obvious thing is to get the current crop off the field as quickly as possible after mowing. This is why haylage fields yield more than those harvested for dry hay; forage for haylage is usually harvested within 24 hours of mowing while hay is left on the field three to five days (or more in the West). Making baleage is another option to get hay off faster, or consider using a hay preservative to harvest slightly wetter hay. These techniques can be especially beneficial not only to the quality of the harvested hay if a rain event is avoided, but also for additional yield in the subsequent cutting. 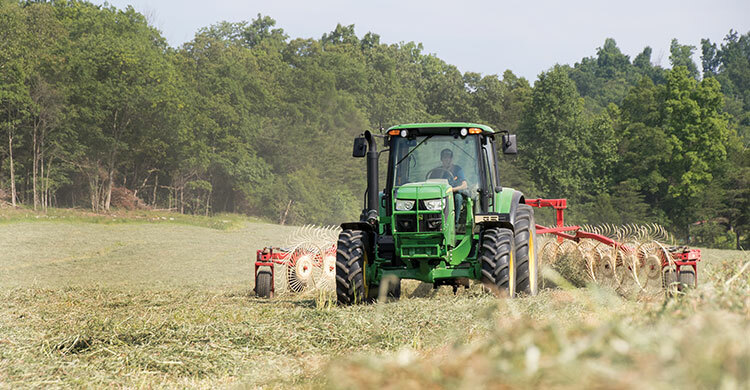 Another strategy to reduce wheel traffic yield losses is to put hay into a wide swath so that forage dries faster and harvesting for hay or haylage occurs sooner after mowing. The average wide swath will reduce hay drying by 24 hours or more compared to putting the hay immediately into a windrow. Consider as well that raking or merging several swaths into one windrow will mean less wheel traffic at harvest. Larger windrows improve efficiency of harvest, reducing the labor and fuel of chopping or baling. Larger windrows also reduce wheel traffic at harvest. Finally, try to drive across the field as little as possible when hauling harvested forage off the field. On some larger fields, operators harvesting haylage have had trucks drive to one point and then off the field in a path. This killed the alfalfa in the path but resulted in less traffic across the rest of the field. Remove bales from the field with the least possible traffic. Drive in baler tracks so that less of the field is covered with wheel tracks. Wheel traffic on alfalfa may be reducing the yield of your next harvest by 10 to 30 percent. It can be worthwhile to consider this when planning your harvest and when purchasing new equipment. This article appeared in the November 2016 issue of Hay & Forage Grower on page 23.